Anyone for cricket ? Were the ashes ever so artistic ? – 365posterblog. Anyone for cricket ? Were the ashes ever so artistic ? We talked sisters yesterday so moving from the impossibly elegant Doris we move on to the similarly statuesque Anna and one of my favorite subjects : cricket. It would have been even more topical if this years Ashes series hadn’t finished with indecent haste this year at Trent Bridge. (I spent a day watching the thrilling climax with my family and they were right it wasn’t all that thrilling!) Still as a fan I wouldn’t admit to that. 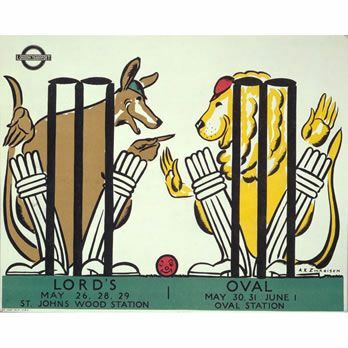 One of a few brilliant sport related images from the 30’s, perhaps another may get an airing tomorrow ? Previous Previous post: How do posters survive ? Next Next post: Into the 6o’s and that letterbox problem !